Caddel went to Stanford on a baseball scholarship but was recruited to the football team by legendary Head Coach Glenn “Pop” Warner. Noted for his spectacular running ability, he pioneered in the use of playing while wearing a flak jacket after suffering two broken ribs. 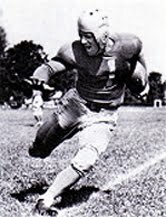 Caddel signed with the Portsmouth Spartans in 1933 and “The Blond Antelope” gained 393 yards from scrimmage (282 rushing, 107 receiving) and followed up with 655 total yards in 1934, the franchise’s first season as the Detroit Lions. His 528 rushing yards ranked fifth in the NFL. Lions went 7-3-2 to finish first in the NFL Western Division while ranking second in the league in rushing yards (1773), touchdowns (25), and scoring (191 points). Won NFL Championship over New York Giants (26-7). Caddel achieved career highs for rushing (580 yards), pass receptions (19), and total yards (730) in 1936. He also led the league in yards per carry (6.4) for the second straight season. Caddel received second-team All-NFL recognition from the league and the Chicago Daily News in both 1936 and ’37, a year in which he again had the NFL’s best yards per carry average (5.6) while rushing for 429 yards. He retired following an injury-plagued season in 1938. Overall, Caddel rushed for 2311 yards on 443 carries (5.2 avg.) and caught 54 passes for 641 yards (11.9 avg. ), totaling 2952 combined yards and scoring 26 touchdowns.